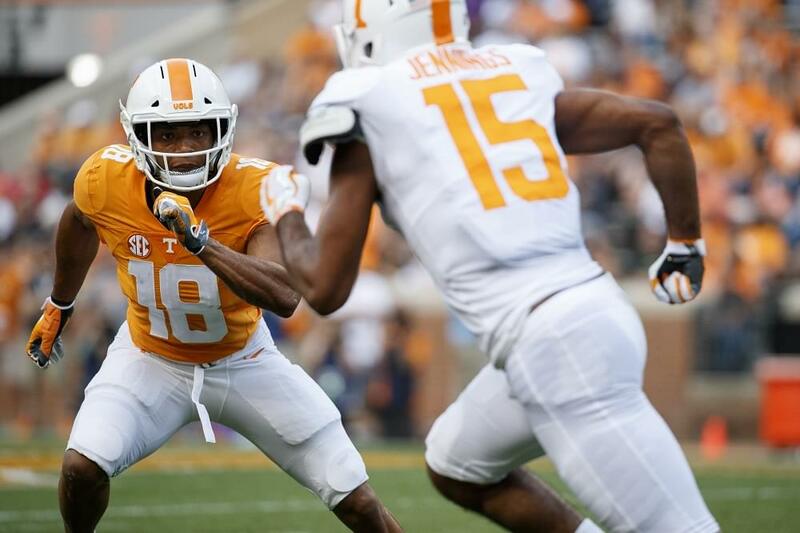 KNOXVILLE, Tenn. – Nine VFLs are slated to see action on active rosters in the playoffs after the NFL wrapped up the regular season this past weekend. 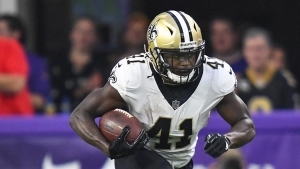 Running back Alvin Kamara and his 18 touchdowns helped lead the Saints to the No. 1 seed in the NFC, while punter Dustin Colquitt filled a major role for the AFC’s No. 1-seeded Chiefs squad along with All-Pro Eric Berry, who appeared in two games in the last month of the season after returning from injury. Rookie punter Trevor Daniel joins veteran offensive guard Zach Fulton on the Texans, who rebounded from 0-3 to finish 11-5, while Morgan Cox continued in his role as long snapper for the AFC North champion Ravens. Defensive back Justin Coleman emerged as a playmaker for the Seahawks and rookie running back John Kelly was a valuable reserve for the Rams. Cordarrele Patterson scored touchdowns rushing, receiving and on a kick return in his first-year with the playoff-bound Patriots. Former first-round pick Derek Barnett helped lead the Eagles to the Super Bowl last season, but he is on injured reserve and will miss Philadelphia’s 2018 playoff run. One of the standout VFL performances in the final week of the regular season came from tight end Luke Stocker, who scored a 22-yard touchdown for the Titans, who just missed the playoffs. Punter Matt Darr returned to the NFL for the final five games of the regular season with the Bills after missing all of 2017. He played for the Dolphins in 2015 and 2016. Darr’s return gave the Vols five of the NFL’s 32 active punters at the end of the 2018 regular season. Defensive end Kendal Vickers became the latest Vol in the NFL on Dec. 24 when he was added to the Titans’ practice squad. Overall, Tennessee had 29 former players on an active roster at some point during the season with 27 appearing in at least one game. Including four practice squad/injured reserve list players, 33 VFLs were on NFL rosters in 2018. Catch up with all of Tennessee’s former players below. Updates from the playoffs will be posted each week on UTSports.com. Berry, a three-time all-pro, returned to the Chiefs for the first-time since the season-opener in 2017. He finished with 11 tackles in two games, but was held out in the season finale against the Raiders. The Chiefs completed a 12-4 regular season to win the AFC South can claim the No. 1 seed in the AFC, receiving a first round bye. UP NEXT: The Chiefs will open the playoffs at home against the lowest remaining seed in the divisional round on Jan. 12 at 4:35 p.m. ET (NBC). Coleman closed out the regular season with one tackle and one PBU in a 27-24 win over the Cardinals. The week before, Coleman tallied five tackles and forced a fumble that was recovered by the Seahawks to help lead Seattle to a 38-31 victory over the Chiefs – the No. 1 seed in the AFC. Coleman has started 10 games and appeared in all 32 contests for the Seahawks the last two seasons, making 90 tackles and scoring three touchdowns. The Seahawks finished 10-6 and second in the NFC West to claim a wildcard berth in the playoffs and the No. 5 seed. UP NEXT: The Seahawks open the playoffs at the Dallas Cowboys in a wild-card round matchup on Saturday at 8:15 p.m. ET (Fox). The older of the two Colquitt brothers, Dustin had a career-low 45 punts for 1,824 yards in 2018 while playing for a Chiefs team that had the AFC’s best record and best offense. He punted just one time for 28 yards in the season finale 35-3 win over the Raiders on Sunday. A 14-year veteran who has spent every season in Kansas City, he will compete in the playoff for the seventh time and fourth straight season. The Chiefs completed a 12-4 regular season to win the AFC South and claim the No. 1 seed in the AFC, receiving a first round bye. Cox completed his ninth season as the long snapper for the Baltimore Ravens, helping lead the team to the AFC North division championship and a playoff berth. He is a two-time Pro Bowl selection, who has played in 134 career games, helped the Ravens secure the playoff berth by beating the Browns, 26-24, last Sunday. The Ravens finished 10-6 to win the AFC North and claim the No. 4 seed in the AFC. UP NEXT: The Ravens will open the playoffs at home versus the Los Angeles Chargers in a wild-card round game on Sunday at 1:05 p.m. ET (CBS). Daniel wrapped up the regular season with seven punts for 295 yards (42.1 average) with four downed inside the 20 in a 20-3 win over the Jacksonville Jaguars. Daniel proved to be a valuable rookie for the Texans, playing in every game and finishing fourth in the NFL with 36 punts inside the 20. The Texans rebounded from an 0-3 start to finish 11-5 and captured the AFC South division crown. UP NEXT: The No. 3 seed in the AFC, the Texans will host the Indianapolis Colts on Saturday at 4:35 p.m. ET (ESPN). Fulton started all 13 games he played at guard for the Texans, including the Week 17 20-3 victory over the Jaguars that gave Houston an 11-5 record for the 2018 season. Fulton signed a four-year, $28 million contract with Texans before the 2018 season after playing four years with the Chiefs. Kamara, the 2017 NFL Offensive Rookie of the Year, picked up where he left off in 2018. Kamara proved to be a legitimate star for the Saints and one of the NFL’s top young playmakers. The Atlanta native’s 18 touchdowns ranked second in the NFL and his 1,800 all-purpose yards ranked sixth in the league. With the Saints having already clinched the NFC’s top seed, Kamara was held out of the season finale to rest up for the playoffs. He has 32 touchdowns in 31 career games to go along with 1,611 rushing yards (5.1 avg.) and 162 receptions for 1,535 yards. The Saints finished 13-3 to win the NFC South and captured the No. 1 seed in the NFC, receiving a first round bye. UP NEXT: The Saints will open the playoffs at home against the lowest remaining seed in the divisional round on Jan. 13 at 4:40 p.m. ET (Fox). Kelly, a backup running back for the Rams, saw his most extensive action in LA’s final game, rushing 15 times for 30 yards and hauling in one 18-yard catch in a 48-32 win over the 49ers on Dec. 30. The Rams finished 13-3 to win the NFC West and captured the No. 2 seed in the NFC, receiving a first round bye. UP NEXT: The Rams will open the playoffs at home against the second-lowest remaining seed in the divisional round on Jan. 12 at 8:15 p.m. ET (Fox). Patterson was a multi-purpose weapon for the Patriots all season, scoring a touchdown as a wide receiver, running back and kick returner. He has four rushes for 66 yards and one three-yard reception in a 24-12 win against the Bills to close out the regular season. Patterson’s 28.8 kick return average ranked third in the league. He has played in 95 games over six seasons and been named All-Pro as a kick returner twice. He has 10 career touchdown receptions, seven rushing scores and six kick return touchdowns. The Patriots finished 11-5 and first in the AFC East in 2018, capturing a first-round bye for the playoffs with the No. 2 seed. UP NEXT: New England will host the second-lowest remaining seed in the divisional round of the playoffs on Jan. 13 at 1:05 p.m. ET (CBS). Barnett suffered a season-ending injury to his shoulder in Week 7. The Eagles finished 9-7 and second in the NFC East to claim the sixth and final playoff spot in the NFC. Bray, a backup quarterback in his sixth season, played in four preseason games for the Chicago Bears in 2018, completing 60-of-97 passes for 652 yards and one touchdown. The California native did not see action for the Bears, and was cut in Week 17 to make room on the active roster for Pro Bowl offensive lineman Kyle Long’s return from injury. Colquitt capped his 10th NFL season with four punts for 180 yards (40.0 avg.) with three fair catches and one touchback in a 26-24 loss at the Ravens. Colquitt had an outstanding third season for the Browns – the most improved team in the NFL going from 1-15 in 2017 to 7-8-1 in 2018. His 79-yard punt against Tampa Bay was the longest in the NFL this season. He finished fourth in punts (83) and total yards (3,767) and No. 11 in average (45.4). Croom capped his rookie season with two receptions for 32 yards in a 42-17 win over the Dolphins. He finished the season with 22 catches for 259 yards and one touchdown. He was signed by Buffalo as an undrafted free agent in 2017 and finished that season on the practice squad before his breakout 2018 campaign. The Bills finished 6-10 and third in the AFC East in 2018. Darr was picked up by the Bills late in the season and served as Buffalo’s punter for the final five games. He spent the 2015 and 2016 seasons as the punter for the Dolphins. He had three punts for 111 yards (37.0 avg.) in the Bills’ 42-17 victory over the Dolphins in the season finale. Dobbs won the backup quarterback job behind future Hall of Famer Ben Roethlisberger in the preseason and was steady during five games as a backup for the Steelers, who narrowly missed the playoff on the season’s final day. Pittsburgh finished 9-6-1 and in second-place in the AFC North division. Foster started all 16 games for the Steelers in 2018, culminating with a 16-13 victory over the Bengals in Week 17. He has started 131 games in 10 NFL seasons. Pittsburgh narrowly missed the playoffs with a 9-6-1 record and a second-place finish in the AFC North. Gaulden appeared in 15 games as a reserved defensive back for the Panthers after being selected in the third round of the 2018 NFL Draft. He tied his season high with three tackles and made his first PBU in the 2018 season finale – a 33-14 Panthers’ victory over the Saints. The Panthers finished 7-9 and second in the NFC South in 2018. Hunter played in five games for the Steelers in 2018 before being placed on the injured reserve list on Dec. 4. Hunter has played in 60 games over six seasons, making 85 receptions. Jackson capped the 2018 season with four tackles and a season-best 1.5 sacks in a 20-3 loss to the Houston Texans. Jackson wrapped up his seventh NFL season and third with the Jaguars. A Pro Bowler in 2017, Jackson has appeared in 110 games in his career with 66 starts. Jacksonville finished 5-11 and fourth in the AFC South in 2018. James started 15 games at right tackle for the Dolphins in 2018, committing only three penalties the entire season. The former first-rounder has started all 62 games he has played in since joining the NFL in 2014. Miami finished 7-9 and second in the AFC East in 2018. Johnson was originally signed to a three-year deal in a developmental role and started out the season on the practice squad. He played in one game against the Texans and ended the season back on the practice squad. The Broncos finished 6-10 and third in the AFC West in 2018. Lewis spent most of the season on the practice squad, but was promoted to the active roster for the Titans’ final game – a 33-17 lost to the Indianapolis Colts. Tennessee finished 9-7 and third in the AFC South in 2018, narrowly missing the wild card berth for the playoffs. Malone appeared in nine games as a reserve for the Bengals. He has seven receptions through 20 career games. Cincinnati finished 6-10 and fourth in the AFC North in 2018. McCullers appeared in 15 games for the Steelers as a reserve defensive lineman. The massive 6-7, 352-pounder did start in 31-28 loss to the Saints in Week 16 and also played in a 16-13 win versus the Bengals in the season finale. McKenzie made four appearances in the preseason and has been on the practice squad all season for the Chiefs after moving from defensive line with the Vols to offensive guard in the NFL. The Chiefs completed a 12-4 regular season to win the AFC South can claim the No. 1 seed in the AFC, receiving a first-round bye. Moseley made his NFL debut in Week 9, making one tackle in the first quarter of San Francisco’s 34-3 win over Oakland. He was placed on injured reserve after suffering an injury in the outing. The 49ers finished 4-12 and third in the NFC South in 2018. Palardy had three punts for 164 yards for a season-best average of 54.7 in a 33-14 victory over the Saints to cap the season. A fourth-year pro, Palardy’s 45.2 average ranked 14th in the NFL and his 24 punts inside the 20 were tied for 15th. Reeves-Maybin played in nine games for the Lions before being placed on the injured reserve list. He has appeared in 23 games over two seasons and made 38 tackles. Detroit finished 6-10 and fourth in the NFC North in 2018. Stocker had a career year for the Titans, starting 11 games and making 15 receptions to tie his career-best with 165 yards. His two touchdowns were also a career high. The eight-year veteran has played in 99 games with 68 starts and made 68 receptions. He capped the 2018 season with a 22-yard touchdown catch in a 33-17 loss to Indianapolis in the finale. The Titans narrowly missed the playoffs, finishing 9-7 and third in the AFC South in 2018. A second-year reserve defensive back, Sutton played in 15 games for the Steelers in 2018. He made two tackles and had two QB hits in the season finale, a 16-13 win over Cincinnati. The Steelers finished 9-6-1 and second in the AFC North in 2018. Williams played in all four preseason games for the Giants, making three tackles. He did not appear in any regular season games and was on the injured reserve for most of the season. Wolf was signed to the Packers’ practice squad on Oct. 30. He spent the preseason with the Tennessee Titans after signing as an undrafted free agent. Vickers was signed to the Titans’ practice squad on Dec. 24. He spent the preseason with the Steelers.